The ultimate hog control arrow. 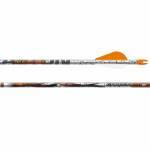 A reduced H diameter heavy duty carbon arrow designed to penetrate the tough hide of a ferral hog. Straightness +/- .005 H Nock Installed ST RPS Inserts included Spine Weight - 340 - 9.6, 400 - 8.8 Quantity - 6 arrows Note: Vane color may vary from the image. 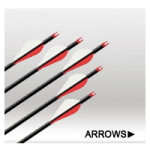 The arrow manufacturers are constantly changing the vane color on arrow shipments. .. The ultimate hog control arrow. 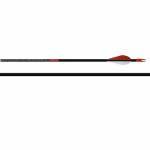 A reduced H diameter heavy duty carbon arrow designed to penetrate the tough hide of a ferral hog. Straightness +/- .005 H Nock Installed ST RPS Inserts included Spine Weight - 500 - 7.3gr/in Quantity - 6 arrows Note: Vane color may vary from the image. 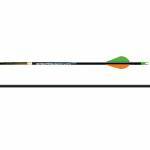 The arrow manufacturers are constantly changing the vane color on arrow shipments. ..
Easton quality at an affordable price. The carbon storm is Easton's base carbon arrow with no frills just a good clean arrow. Includes 2" vanes and inserts * Straightness +/- .006 * Weight Tolerance - +/- 2.0 grains * Spine Weight - 300 - 9.1, 350 - 8.3, 400 - 7.5 Note: Vane color may vary from the image. The arrow manufacturers are constantly changing the vane color on arrow shipments. .. Enjoy your hunt with your favorite Under Armour brand. Introducing the NEW Under Armour arrow.. Pre-installed H Nock H 8/32 Inserts - Included Detailed Graphic Overlay Carbon Straightness:±.003" Micro-smooth finish 300 10.2gpi, 340 9.6gpi, 400 8.8gpi Sold in Qty of 6 .. The Bowfire has a killer all shaft carbon overlay graphic, and is designed for today's hottest bows. Pre-installed S Nock CB inserts - Included One-size SB Insert - Fits all shaft sizes Detailed Graphic Overlay Carbon Straightness:±.003" Micro-smooth finish 330 9.6gpi, 400 8.5gpi, 480 7.5gpi Sold in Qty of 6 ..
For Bows Up To 35LB Durable Fiberglass Shaft Precision Target Point Comes in a 3 Pack Note: Vane color may vary from the image. 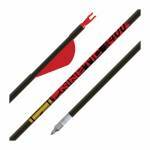 The arrow manufacturers are constantly changing the vane color on arrow shipments. 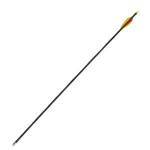 ..
Barnett replacement arrows work with any of the Barnett Youth bows. Works with both recurve and compound bows. Sold in 3-Packs Note: Vane color may vary from the image. 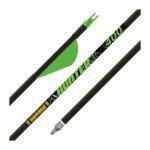 The arrow manufacturers are constantly changing the vane color on arrow shipments. .. 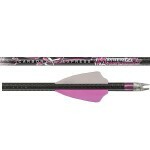 The Mayhem Hot Pursuit is the COMPLETE performance package designed for the female hunter starting with a BuffTuff custom front-end design leading to the pink label and white and pink fletching finished with a pink BullDog nock collar. Also features our exclusive Carbon Express Built-in Weight Forward technology for superior down-range accuracy with a broadhead. Equipped with Fusion vanes for precise broadhead placement and BullDog nock collars for added strength. The Mayhem Hot Pursuit sets a n..
For bows up to 40 lbs. 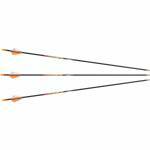 Nocks, field points and fletching installed 23.5" arrows designed for young shooters 3-Pack ..
For bows up to 40 lbs. Nocks, field points and fletching installed 23.5" arrows designed for young shooters .. The hands-down proven small diameter all-carbon arrow. Faster, Deeper, Deadlier. * High strength carbon composite fivers * X-HIT insert 8-32 * X Nocks come pre-installed * Includes 2" Blazer vanes * Straightness: +/- .003". * Spine Weight - 9.5 (340) 9.0 (400) .. Combine the precision and straightness of aluminum with the stiffness durability and extra speed of carbon and you have hunting-arrow perfection. FMJ Carbon Core construction utilizes a small-diameter thick-walled carbon core with Hidden Insert Technology (HIT) for amazing penetration and superior durability. Low-glare microsmooth alloy surface reduces wear on the arrow rest eliminates draw noise and makes for easier removal from targets. All arrows come complete with X Nocks installed Blazer va.. Increased penetration with a smaller diameter shaft and increased speed of lightweight carbon. Both are in the Bloodline Carbon Arrow. * Factory crested * Guaranteed straightness +/- .003 inches * Pre-installed Red H Nocks * High-strength carbon nanotube N-FUSED fibers * HP inserts - included * Fletched with 2 inch Blazers * Straightness +/- .003 * Weight Tolerance +/- 0.2 * Spine Weight - 8.7 (330), 7.7 (400) ..
Low profile H diameter shafts to reduce wind drift, and lower friction for deadly penetration. Factory crested Pre-installed pink H Nock HP inserts – included Straightness: ± .003 Weight tolerance: ± 0.2 grains within a dozen Hot pink ..
Easton Deep Six AC Injexion Arrow Shafts. 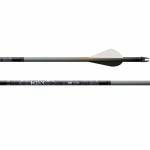 Build your own precise custom arrows with these arrow shafts. Spine: 330 Straightness:±.002 Weight tolerance:±2 grains Easy target pull Sold in Qty of 6 ..
Easton HEXX Arrow Shafts 330 - Dozen. The ultimate high speed carbon arrow. Shaft Weight 7.9. Stock Length 31.5 Inches. Microlite H inserts included Pre-installed white H Nock Straightness: +/- .001" Weight tolerance: +/- 1 grain Factory crested Quantity - 12 arrows .. Throw down the HEXX with the ultimate high speed carbon arrow. Pre-installed H Nock Microlite H inserts – included HP Insert – sold separately Straightness: ± .001” Weight Tolerance: ± 1 grain Factory Crested 2" Blazer Vanes 400 - 7.2gpi, 330 - 7.9gpi .. The sport of bowhunting can often lead to challenging situations and conditions.Gold Tip's Hunter family of arrows provide the versatiltiy ot meet the demands of every level and challenge you may come up against. Providing speed, stability and strength, thanks to Gold Tip's Smart Carbon technology, the Hunters have become the "go-to" hunting arrows for many thousands of bowhunters. Weight Tolerance +/- 2 grains Straightness +/- .003 340 - Weight 8.9 gr/in, Spine .340", OD .300", ID .2..
For bowhunters looking for a durable, hard-hitting, small diameter shaft that still provides unmatched straightness retention, the Kinetic family of arrows meets the challenge. If you're hunting larger game or striving to increase your accuracy in wind and inclement weather, the Kinetic shafts are constructed with Gold Tip's Smart Carbon® Technology and engineered to deliver maximum kinetic energy. Weight Tolerance +/- 2 grains Straightness +/- .006 340 - Weight 9.9 gr/in, Spine 340, O..